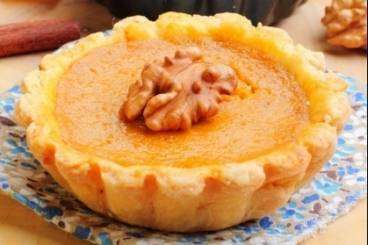 An American classic - a sweet, custardy pie made with spiced pumpkin or butternut squash in a homemade pastry case. Add the salt to the flour and then add the diced cold butter. Beat in a food processor to begin combining the indredients and then slowly add in the cold water until the pastry just holds together. Do not overwork the mixture - you just want to bring the mixture together. Roll in to a ball and chill in the fridge for at least 30 minutes. After half an hour, roll the pastry out on a floured surface. Cut into discs larger than the size of the individual tart cases. Press the pastry into the buttered tart cases and trim any excess from around the top. Prick the bases with a fork and then line with baking parchment. Add baking beans, transfer to the oven and blind bake for 5 to 10 minutes. This will help stop the base of the pumpkin pies from becoming soggy. Cut your pumpkin or squash into large, equal sized chunks and place into a roasting dish, skin-side down. Cover with foil and bake for 45 minutes to 1 hour at 180'C until the pumpkin is soft. Once cooked, allow to cool for a few minutes and then spoon the pumpkin flesh into a food processor. Make sure to discard all of the skin at this stage. Blend the pumpkin flesh until completely smooth. You need 250g of pumpkin for this recipe - weigh this out and you can freeze the rest. While the pumpkin puree is cooling completely, scrape the seeds from the vanilla pod and separate the eggs. Set the yolks aside and whisk the whites until fluffy. Add the caster sugar, cornflour, ginger and cinnamon to the cool pumpkin puree and combine well. Next add the egg yolks, the seeds from the vanilla pod and the milk. Fold in the beaten egg whites and then pour the pumpkin mixture into the tart case. Grate a little nutmeg on top and then press a walnut into the top of each pumpkin pie. Transfer to the oven and bake for 20 to 25 minutes until the tarts are a light brown colour at the edges and firm in the centre. This dessert can be served hot or cold and is delicious with whipped cream, double cream or ice cream.